Moving home is hard enough, but moving home with a pet makes the process all that bit harder. 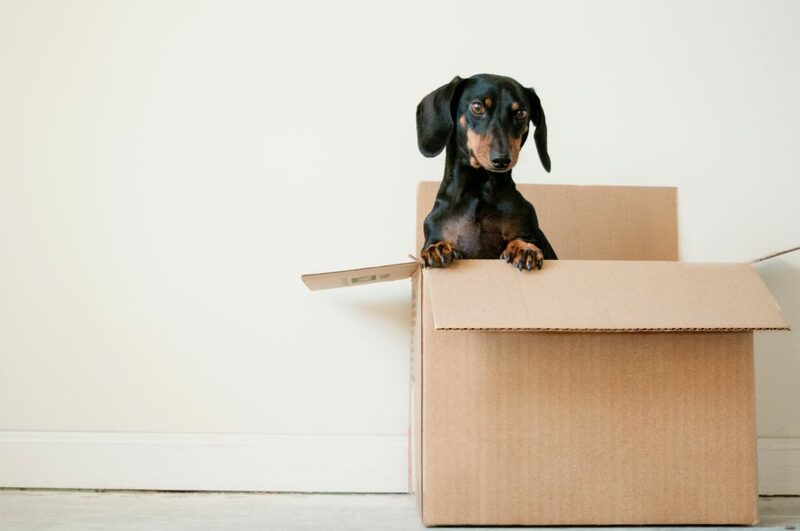 Here with give some useful advice for families moving with Pets. You’re pet will need an airline approved travel kennel big enough to allow him of her to turn a full circle once inside. Buy the kennel as early as possible and keep it in your pets area so that he or she can get used to it. The kennel top and bottom can be separated, so you can even try to get your pet to sleep in the kennel by putting their blankets/cushions/toys in the kennel. There are some Vet documents that you will need even if your pet has an up to date pet passport, so be sure to visit you vet 3 or 4 months before the move to start the process – your pet will eventually need a health certificate and upto date inoculations and there are some time restrictions on these that your Vet will give you guidance on. Booking the flights can be tricky, different airlines have different conditions, some will only allow one animal per flight, some will allow small pets in the cabin, other don’t. Choose a direct flight, because animals that transit can become a very stressful time for your pet as animals in transit MUST stay in their kennels and the holding areas are not generally climate controlled. When you by your kennel you will also be given a water bottle (the ort that you find on a hamster cage albeit bigger). You can give them some training on how to drink from the bottle, but in my experience cats get the hang of drinking from a water bottle quite quickly, but dogs on the other hand rarely manage to drink. Take this into consideration when you’re feeding and watering your pet before the flight, of course you don’t want them dehydrated but you also don’t want the peeing too much because they will soak their blankets quite quickly. We don’t advise any tranquilisers, and I’ve not met many vets who would. There are some herbal calming tablets, but we’re not sure of the effectiveness. A toy, familiar smelling blanket, even an old tee-shirt of yours will bring some comfort to your pet whilst in transit. There’s no avoiding the fact that the journey will be scary for your pet – lots of strange people, smells and noises, and of course being caged is unpleasant – HOWEVER, your pet also learns quite quickly that the travel kennel is also their protection from this unfamiliar outside world so they do take some comfort from being protected by the kennel. Click Moves is an International Moving company with extensive experience in moving pets around the world.